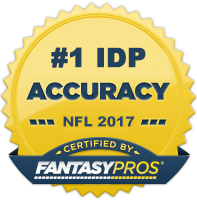 OK. Let's start things off by going through some IDP news, notes, and commentary from Week 11 of the NFL season. Antrel Rolle was probable heading into last week but tweaked his knee on Saturday and ended up missing Sunday's game. The Bears defense has not been very friendly in IDP terms, so I would largely avoid their players if possible. Mario Williams injured his foot last week and may miss Week 12. Many owners likely cut bait with him recently as he's done much of nothing all year long. Jamie Collins missed yet another week due to illness as he's still trying to get back into game shape. We should get a better indication of his status for this week's game later in the week. Prince Amukamara said he's 100% for Week 12. Fantasy owners should take notice as he's been one of the more consistent tackling fantasy corners over the last couple years. And he has a plus matchup against the Redskins this week. DROTY candidate Kwon Alexander was just slapped with a 4-game suspension for violating the league's performance enhancing substance policy. He's appealing the suspension, so he will keep playing until that process is resolved. Owners should have a back up plan in place. While we are on the topic of Tampa Bay linebackers, Lavonte David had his best fantasy performance of the year with 6 solo tackles, 2 interceptions, a pass deflection, and a defensive touchdown. Those who practiced patience with him are being rewarded. And those who cut bait, are likely regretting that decision. Kenneth Acker returned to action last week after missing a game due to injury. However, he was benched for Marcus Cromartie during the game. Acker's been a productive fantasy player for us this year as he's struggled in coverage and gotten thrown at a lot, but that run may be over. Unless the 49ers coaching staff indicates he's getting his job back, he's safe to drop. Both the Bengals and Eagles are rotating all of the starting non-pass rushing linebackers and consequently no prominent fantasy player is receiving every down snaps. Players such as Vontaze Burfict, Vincent Rey, and Mychal Kendricks can still be productive even with reduced roles, but their risk factor goes up substantially. I'd be avoiding these linebacker situations if possible until someone emerges as a three-down player. Calais Campbell and Carlos Dunlap both struggled mightily in recent weeks. But as I almost always do, I'm preaching patience with these guys. Both players have been consistent throughout their careers and there is no reason to believe this downturn in performance will continue for the rest of the year. Take Cameron Wake this year as an example. Stick with your studs. DT Linval Joseph (MIN) - I called out Linval Joseph last week, but in case he's still available, now is the time to pick him up. Although he only has 0.5 sacks on the year, he's on pace for a ridiculous 60+ solo tackles and has 26 total tackles in his last three games. He's flourishing in Mike Zimmer's system and locked in as a DT1/DL2+. DE Corey Liuget (SD) - Liuget doesn't make a lot of appearances in this article as he's established himself as a solid DL2 over the last three years and is typically owned in most leagues. However before his 5-1-1 stat line in Week 11, he hadn't made a tally in the box scores since Week 7 due to injury and a bye week, so he's less rostered than he should be. He has a nice remaining schedule as he faces the Jaguars, Chiefs, and Dolphins over his next four games. Pick him up if you need a high floor, DL2. DE Kony Ealy (CAR) - After struggling to find his feet the last couple years, Ealy has finally started to produce. He's had a sack in each of his last 4 games. He won't factor into the run-stopping game much but can be beneficial to users in sack-heavy scoring systems. Charles Johnson will return from an extended absence, but will be on a snap count so it shouldn't hurt Ealy's production too much this week. Owners may want think about picking up and stashing Johnson as well for the stretch fantasy playoff run. OLB Justin Durant (ATL) - Durant's been mentioned here several times throughout the year but keeps fading out of owner's minds due to two separate stints on the injury list. It's clear at this point that when healthy, Durant is the Falcons' most productive linebacker. Yes, there's an obvious injury risk with him, but it's probably worth it considering he will give you LB2-/LB3+ numbers and is not owned in many leagues. LB Kelvin Shepherd (MIA) - Shepherd has posted stat lines of 8-3 and 11-4 in the past two weeks filling in for Jelani Jenkins. He's played nearly every down during this time and makes for great fill-in for as long as he's in a three-down role which could figure to be a couple more weeks as Jenkins is rumored to have a high ankle sprain. LB2-/LB3+ until further notice. OLB Brian Orakpo (TEN) - Orakpo got off to a slow start with his new team registering just two sacks in his first seven games. But, he's had five sacks in his last four and hasn't gone a game without taking down the quarterback since Week 7. The matchup next week against the Raiders isn't ideal but he's been matchup independent recently and has the Jaguars on the schedule in Week 13 - a team he just had a sack against. Big play LB3-/LB4+. ILB Will Compton (WAS) - Compton has seen every down action with Keenan Robinson out with an injury. If Robinson sits again, Compton becomes a decent LB3-/LB4+ play for those in deeper leagues. He's had 27 tackles in his last three games, however 19 of those were assists as those games had assist-heavy stat crews. He gets a solid tackle matchup against the Giants and I could see a 3-6 or 4-7 stat line out him this week if he gets the start as he plays in Washington. CB Logan Ryan (NE) - Ryan has been a top 3 corner since Week 6. He's managed at least 4 solo tackles or more in 5 of the last 6 weeks to go along with 2 interceptions and 6 pass deflections. He has a top 5 matchup against the Broncos this week, so start with confidence. S Will Allen - I mentioned Allen last week as a player to keep in your mind coming out of his Week 11 bye but want to give you another reminder here. It's hard to find consistent production at the DB position and Allen can give that to you. He's put up starter level points in virtually all the games he's played this season and should be back fully healthy after a week off. I'd feel comfortable having him as my 3rd or even 2nd defensive back in fantasy leagues. S Clayton Geathers (IND) - Geathers, a rookie out of Central Florida, got the start over Colt Anderson with Mike Adams out. He made the most of his start putting up 9 total tackles (7 solos). He will head back to the bench when Adams is healthy but should make for a strong fill-in for as Adams is out. Geathers is shaping up to be the starter at strong safety in the not-so-distant future. Dynasty owners should take notice.